So, since the last post, I’ve spent a lot of time working on Witch Queen. I’ve actually added just around 9000 words (roughly 27 pages) to it, and I’m fairly happy with it thus far. It’s really my goal to have this finished, at least by the end of NaNo this year. 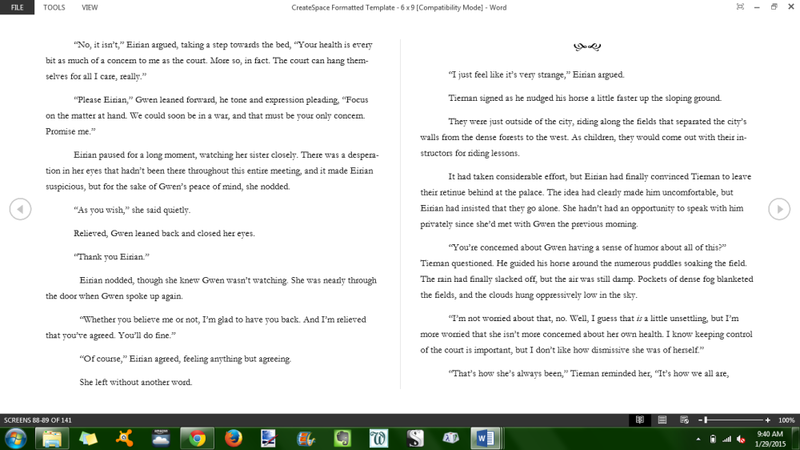 I might actually make finishing it my NaNo goal, instead of working on something totally new this time. I really, really don’t need to start any new stories. Anyway, that’s kept me quite busy. 9000 words in a week is by far not a record for me by any means, but it’s still more than I’ve written on a daily basis since November. Following an already finished outline helps. 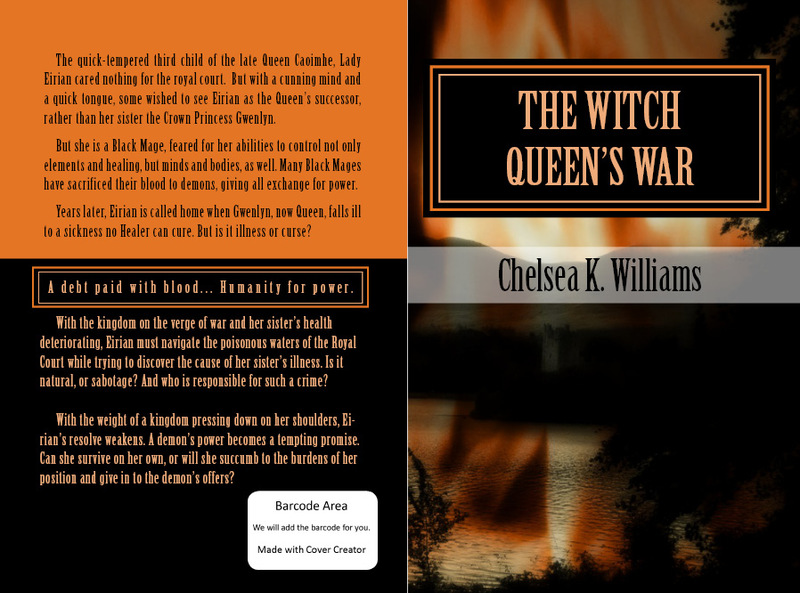 Last night though, I spent some time on Createspace, which is who I intend to use to create the book, since it’s usually who I see recommended on the Nano forums, and they’re the ones who offer the proof copy if you meet the goal of 50000 words. I’d already spent a little bit of time on their site sometime back, but I really spent some time working on it last night. I’ve got a potential cover up and going, which is over on the right of the page. It’s also kind of one of the main points of the post, since I’m actually rather pleased with the way it’s come out so far. It’ll have to be edited a bit to allow for the spine width, but that won’t be possible until I’m finished writing and have a total page count. So it’ll change, but I’m going to stick with this overall design. I really do like it, actually. The image definitely has to be opened for the summary on the back to be clear. I had to edit it a little bit, since it was a little bit to long, and not very legible. Again, there’s my problem with summarizing. The image on the front is a manipulate photo, courtesy of one of my aunts, from one of her trips to Ireland. I’ve created a new page up in the header that’ll be used for the projects that I’m currently working on, and once I have that set up a little better, I’ll definitely add a larger version of the cover to that. Hopefully, that page will also help get rid of some of the clutter over in my sidebar, maybe. We’ll see. I also might start posting a few excerpts from this one. I think I may have posted some way back when I first started this blog, but I can’t remember. If I did, anything that gets posted now will be a highly edited version. This is so very random, but I just have to say something about it while it’s on my mind. Some pages look like this. 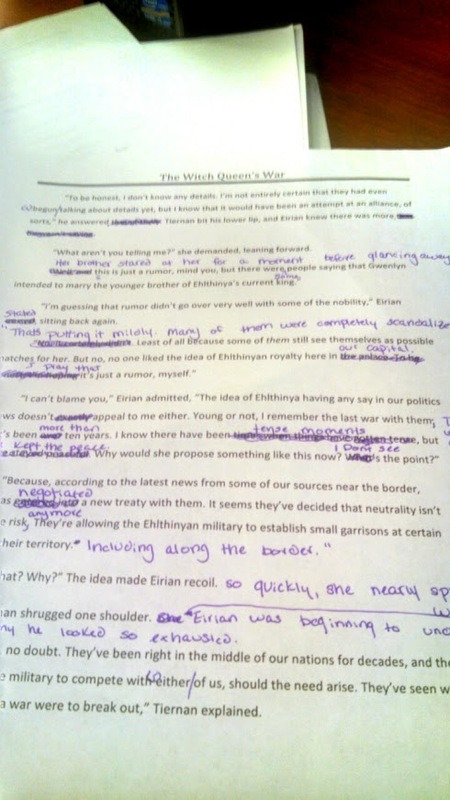 The corrections are in purple, this time. I don’t like to use red. Reminds me too much of high school. I apologize for the quality of the pictures. The lighting in the library right now is… interesting. I suppose they don’t think people will be taking a lot of pictures of what they’re working on. Anyway. This is one of the pages of Witch Queen that I just got finished rereading, and this is what came of it. Strike outs everywhere and ten million things rewritten and changed. And yes, when there’s this much and more, it becomes a bit of a challenge to figure out what correction I wanted to go where. So that was page… 27. Page 27. Then here’s page 28: There’s hardly anything there. A few words, and even then, I think I really just kind of swapped words out. I don’t really think I added anything new to it at all. These pages are literally back to back, no pages between them. I question myself a lot, but apparently some pages just seem to come out better than others. Does anyone else have this happen to them. Sections that sound really, really good, and then, like the very next section, you read it and wonder if you forgot the most basic rules of your native language? Or is this just another weird, nitpicky thing that I do to myself because I’m apparently some type of masochist? First day back to classes, and I’m sitting here in the computer lab staring at my notebook, trying to figure out which of my stories that I want to work on. I have the (physical) notebook for Ashes with me, but I’ve got an older work pulled up on the computer. It occurs to me that I have four or five open stories that I’m working on, two semi-solid ideas floating in my head, and a couple of Dragon Age prompts that I’ve considered taking on. Opps. How did this even happen? I love all my stories dearly, I just get distracted very easily. Once I get an idea into my head, I latch onto it. And, in all honesty, I never really put any of my stories aside. All of the documents are there in their own neat little folders, waiting to be worked on. The only one I haven’t really touched recently is Nuit, which was my Nano10 work. I think. Curse was finished, but then my laptop exploded. Someone had to learn the hard way about what can happen when you don’t back up your novel to more places than just a computer. Most of it was saved, but the ending (the ending of all F@&%$!G things!) was lost. I still haven’t written the ending back out yet, because, surprise surprise, I want to change it. I don’t think it sounded good enough. No, seriously. I’ve turned in papers like that. The last one didn’t even sound coherent to me. All I know is that there was something in there comparing a line in Frankenstein to a line in the Nicene Creed. I think. I got an A+ on the paper, just throwing that out there. But I’m really hard on myself when it comes to what I’m writing. That’s what makes nano such a challenge for me. It isn’t the word count. I can, and have, done that with little problem more than once. It’s the fact that I’m never satisfied with what I get down. I write two lines, and I’m tempted to erase all but a few words because I think they sound awful. In reality, they usually don’t sound that bad. I’m aware that I do have some talent as a writer. I wouldn’t do so well in my classes if I didn’t, but it’s hard to recognize that when I’m actively working on a project. And it isn’t limited to writing. I do the same thing with any creative thing that I work on. I have insanely high standards for myself. There are very few people who can ever be harder on my writing than I am, personally. There is seriously nothing that I don’t criticize when it comes to my writing. So this is an ongoing fight with me. It’s one of the reasons that I have so many open stories that I’m still working on. Ashes and The Witch Queen both have outlines. As in completed, beginning to end, outlines. So those two are my first goal. 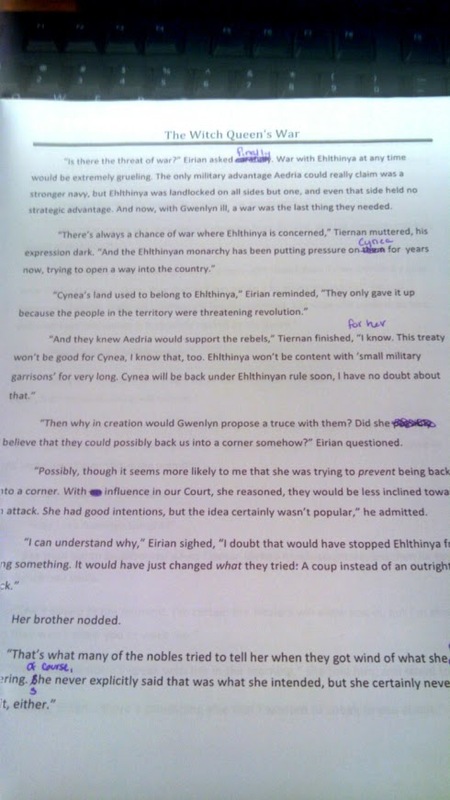 Of course, I edit outlines. Seriously. I even edit and criticize my outlines. No joke. Anyway. That’s my goal for the New Year. I don’t make resolutions, because I’m not the type of person to do them, but that’s a goal for me this year. I want to finish some of these stories. I also want to try and update my blog more. Hopefully, one goal will influence the other.